00:31:00 Makes 16 servings, 1 biscuit (41 g) each. Makes 16 servings, 1 biscuit (41 g) each. 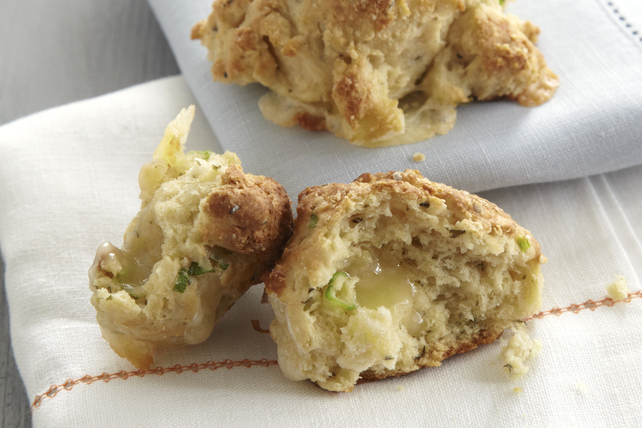 These savoury easy-to-make biscuits are perfect to serve as part of a fall dinner. Mix flour and baking powder in large bowl. Cut in cream cheese product with 2 knives until mixture forms coarse crumbs. Stir in cheddar, onions and sage. Add milk; stir just until mixture forms soft dough. Drop 2 Tbsp. dough, 2 inches apart, into 16 mounds on baking sheet. Bake 13 to 16 min. or until golden brown. Prepare using 1 Tbsp. chopped fresh sage. Use your food processor to mix the biscuit dough. Serving Size Makes 16 servings, 1 biscuit (41 g) each.